Consider the Risks and Hire a Legitimate Company. Tree work is more difficult and dangerous than most people realize. Hire trained skilled professionals with the proper safety and rigging gear, licenses, and insurance. Hire a Company with a Licensed Arborist. Connecticut law requires that a licensed arborist perform tree work such as pruning, trimming or bracing. 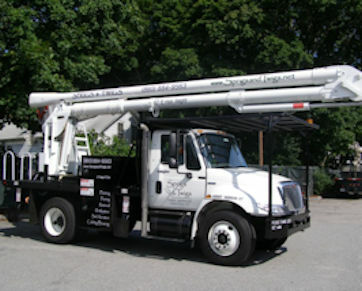 A licensed arborist has met rigorous testing requirements and holds a license issued by the Connecticut Department of Energy & Environmental Protection. Ask to meet the arborist and see his license. Business Licenses. Request a copy of the tree company's Connecticut Home Improvement Contractor business license and its Connecticut Department of Energy & Environmental Protection arborist license as proof of its legal business operation and commitment to high quality standards. Insurance. A reputable tree company will have current liability insurance and be willing to provide you with a Certificate of Insurance (proof of coverage) with you listed as an additional insured. A company without insurance means you could be sued for damage or injuries that occur on your property that your homeowner's policy will not cover. Employees. When reviewing a company's Certificate of Insurance, check for proof of Workers' Compensation Insurance, a policy that covers employees if they are injured on the job. Safety Gear & Equipment. Check for well-maintained trucks and new safety equipment. Groundsmen should be wearing helmets with face shields or protective glasses and steel toe boots. Climbers should have the latest in safety and climbing gear including the proper saddle, helmet, glasses, steel toe boots, and climbing ropes. Written Estimate. Connecticut law requires that you be given three copies of an estimate with specific wording that allows you to cancel the contract if you change your mind. A legitimate tree company will always put its estimate in writing with the appropriate cancellation language. References & Reviews. Ask for tree work references and check out a company's reviews and portfolios. Better Business Bureau. The Connecticut Better Business Bureau is a membership organization which provides reports on business firms and assists in resolving consumer complaints. Call (203) 269-2700 or visit www.ct.bbb.org for more information about Sprigs & Twigs or any company you are considering for tree work.